Calgary Ski Club A Recreational Club for All Ages! WELCOME! LOOKING FOR FUN, MEETING PEOPLE, AND MAKING NEW FRIENDS? Are you passionate about the great outdoors and want to be active all year round? THEN THE CALGARY SKI CLUB IS FOR YOU! 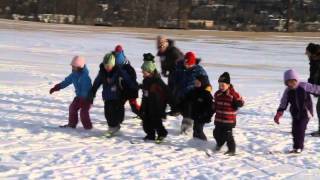 We teach Cross Country Canada's Jackrabbit Ski Program to children ages 5 to 12. A team of enthusiastic coaches will encourage the learning of basic skiing fundamentals for classic skiing. Lake Louise Loppet - 2019 - Results are Here! Congratulations go to all the racers and participants. Click here for more details about the Lake Louise Loppet. Adults' lessons programs are OPEN for registration. Click here to see the upcoming lessons programs. See the "Using Meetup" note below. Click here for information. See the "Using Meetup" note below. Option 1: use another web browser (e.g. Google Chrome, Firefox, Microsoft Edge, etc.) – The Meetup support webpage indicates that Meetup no longer supports Internet Explorer. The Calgary Ski Club would like to inform you of a change to their mileage rates for use of your vehicle while on Club business. We will be following Canada Transport Guidelines. This rate will change in accordance with these guidelines. Effective immediately, members will be paid $.58 per kilometer traveled. This applies to all travel, including towing of trailers and equipment. This does not apply to car pooling events. Should you have any questions or concerns, please do not hesitate to contact your President at president@calgaryskiclub.org or the Office Administrator at office@calgaryskiclub.org. Shaganappi will remain open to cross-country skiers and snowshoers until March 24th! Please stay on marked trails and be mindful of posted dangers on the trails. Click here to sign up for our online eNewsletter. to let us know that somehow we've missed you.